The city of Sibenik looks over the glistening waters of Sibenik Bay and its neighbouring islands, while the medieval old town glimmers with white marble flagstones and a steep labyrinth of alleyways. 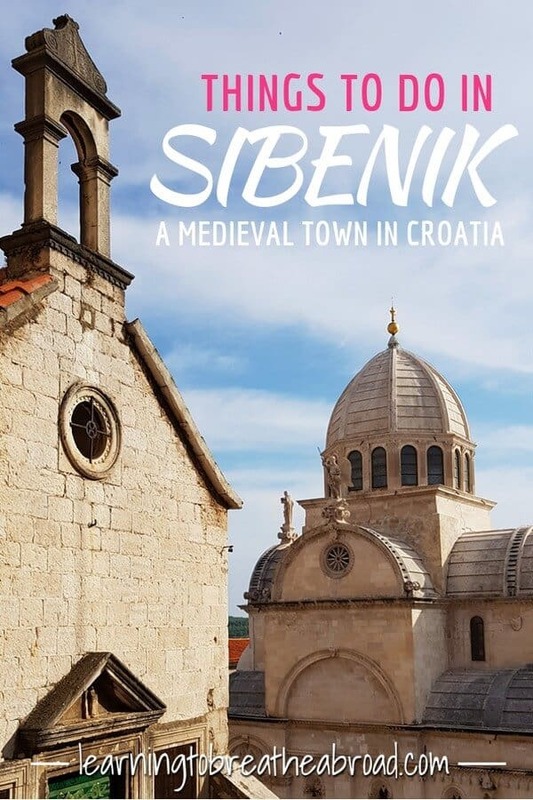 Sibenik is located in central Croatia, where the Krka River joins the Adriatic sea and is an important access point to the Krka National Park and the Kornati Islands. 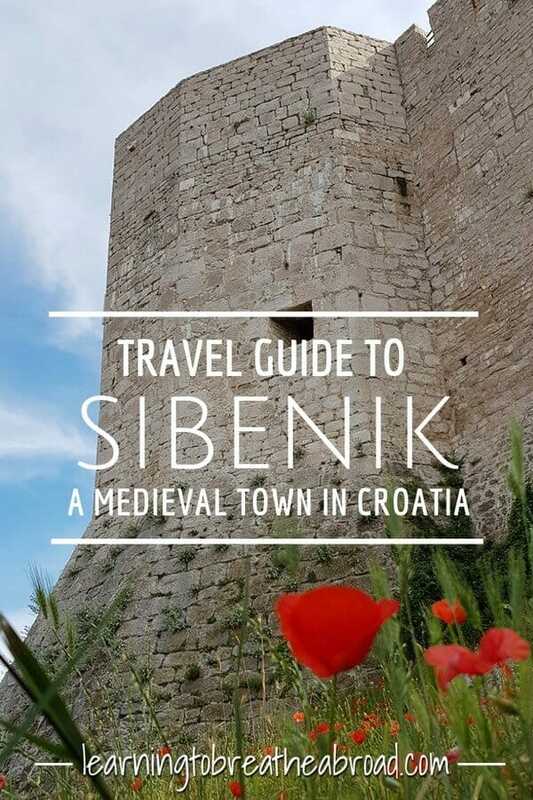 With fortresses, cathedrals, medieval gardens and churches, there are many things to do in Sibenik. Our main aim when choosing a spot in a campsite is the wifi strength, so we spend the first 30 minutes wandering around with our phones in front of us, testing the signal strength and marking the number of the relevant camping spots. Then we go back to reception where they check if any of our ones have been reserved and voila, we have a new home. 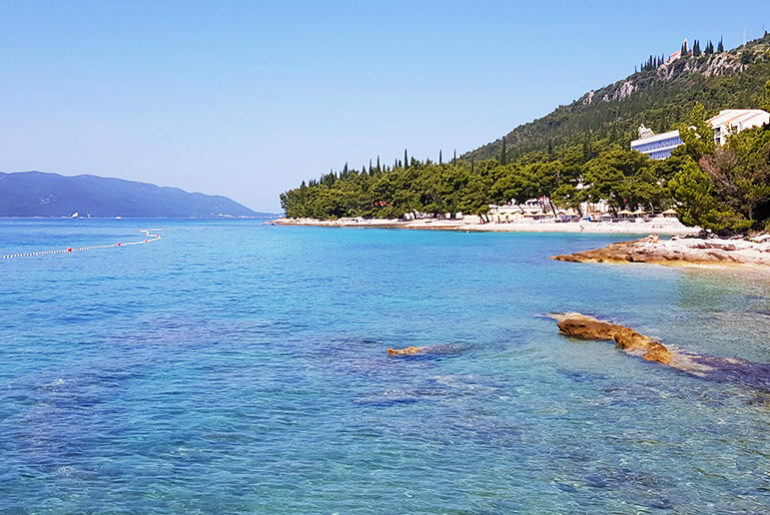 For our stay in Sibenik (pronounced as shee-ben-ick), we stayed at the Solaris Camping which was 5.5km from the old town centre. The perfect distance for a bike ride into the city – well, so we thought! Those that know me, know I hate riding bikes, but since we started our trip I’ve been quite enjoying cruising around on our bicycles. Most of the terrain has been flat. Yes, we’ve had some hills but nothing too bad… until we rode into Sibenik! To put it mildly, I nearly died! In fact, some of the roads were so steep, I could hardly walk up to them, but the views were amazing. To get to the old town, you have to drive through the new town and it ‘s almost enough to make one turn around. The outskirts are really derelict and shabby, but if you push on through the old city is a wonderful delight. 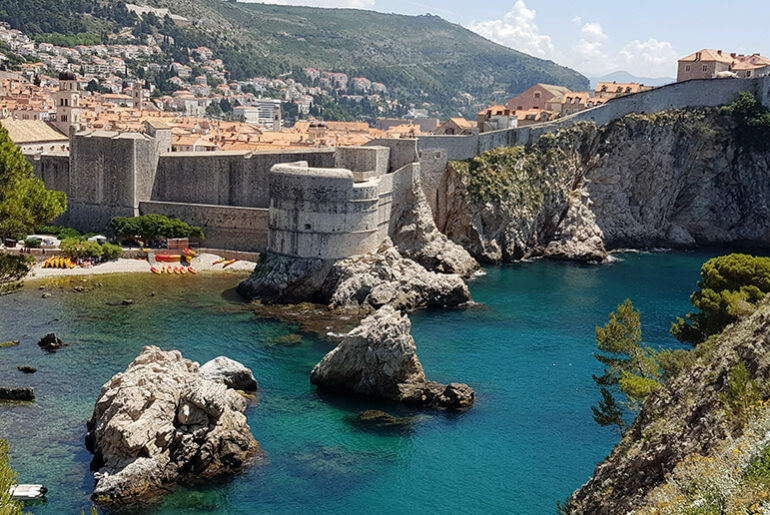 We decided to start at the highest point of Croatia’s UNESCO Fortress City and work our way back down, so the first stop was St Johns Fortress, with its incredible panoramic view over the city, the sea, and St Michael’s Fortress. The Barone Fortress was just a few steps away with both of these fortresses residing at the top of the steepest road I’ve ever seen. We could barely walk up, let alone ride our bikes! The St John’s Fortress is really just a dilapidated building, but the views are worth the hike. The Barone Fortress has been beautifully renovated with a terraced restaurant overlooking the city and a playground for kids. The entrance fee is 50 Kuna, but it includes entry to St Michael’s Fortress. From so high up, it was a nice freewheel down to St Michael’s Fortress. St Michael’s Fortress was fully renovated in 2012 and now is home to a permanent open-air stage with more than 1000 seats. The views from the fortress are fabulous, either looking up to St John’s Fortress on the hill or out over the sparkling waters of Sibenik Bay and its little islands. Sibenik old town has 2851 stone steps – the most in all of Croatia! So we locked up the bikes and set off on foot through the labyrinth of seriously steep staired alleyways. The city is oh so white, with white buildings and white marble flagstone steps. It was neat and clean and charming. 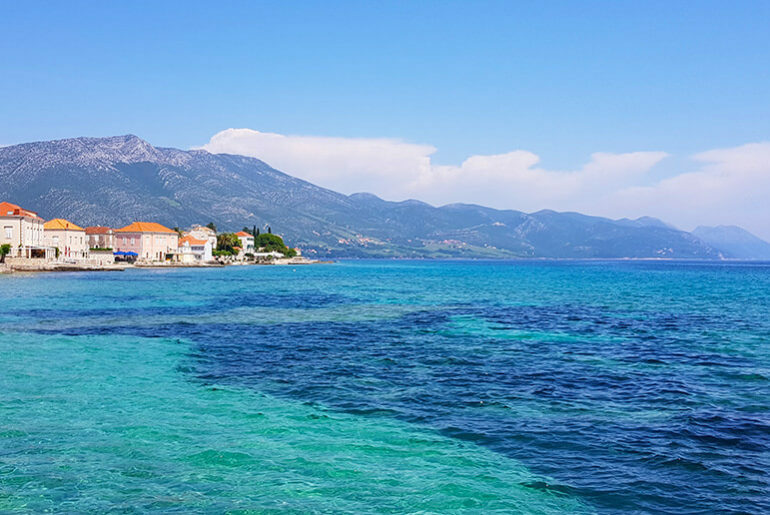 The sightseeing attractions are impressively signposted and most alleyways have some attraction trying to entice you in, from churches to caves to medieval gardens. You can spend hours following the signs and seeing where they lead you. There is something magical about getting lost in the maze of narrow little alleyways of these old towns and suddenly popping out in a huge square with a magnificent cathedral and Sibenik didn’t disappoint. The St James Cathedral is a masterpiece as it was built entirely of stone – no cement or mortar was used at all. There are also some 70 faces carved around the back of the church that represent the citizens from the 15th Century. St Ana’s cemetery is supposed to be beautiful but sadly it was closed for renovations. We stopped by St Lawrence’s medieval garden which depicts how a traditional medieval garden would have looked. The oblong garden is laid out in neat geometric pattern with the same herbs and plants that would have been used in the medieval kitchens and medicine. There are also some fruit trees and roses and other flowers have been added for colour. The garden is an oasis of tranquility in the old town, so the perfect place for us to enjoy a coffee at the little restaurant in the garden. The St Francis Church and Monastery may look simple from the outside but step inside to see the 16th-century wood paneled ceiling and impressive artwork. If you walk around the church to the back, you will find a door in the wall, leading to a pretty courtyard. Here you will find the St Francis Museum which is a monastery library with rich collection of manuscripts and books. Thankfully the ride home was mainly downhill and there was a nice pebble beach 10 steps from our campervan, so we could relax after a busy day. We decided to treat ourselves to dinner out at the Campsite restaurant, but it was super expensive, so rather eat in town if you are going that way. We stayed at Solaris Camping Beach Resort. It had lovely big pitches, great wifi, a white pebble beach with a beach bar, restaurant (ridiculously expensive!) and a huge supermarket. It’s a 6km bike ride into Sibenik, but very hilly so quite tough.